Here it is- finally! 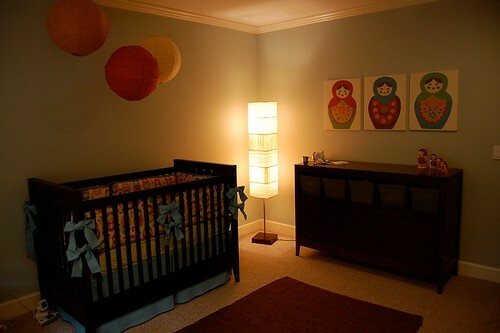 The nursery is complete! Decorating and preparing this room has been such a joy to me. 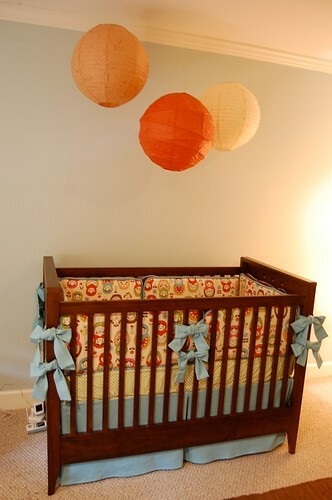 I have always looked forward to creating my one of a kind nursery, and I hope Megan Lael will enjoy it as much as I have already! Here's the view from behind the chair. The BEDDING!! Thank you, Brooke for all your hard work and countless hours to make this beautiful bedding set! I LOVE it! Thanks to my wonderful hubby who tied such beautiful bows! No-- really, he tied them. Oh, how I love him! I was able to find these sheets (and yes, I bought TWO extra sets) that match perfectly! 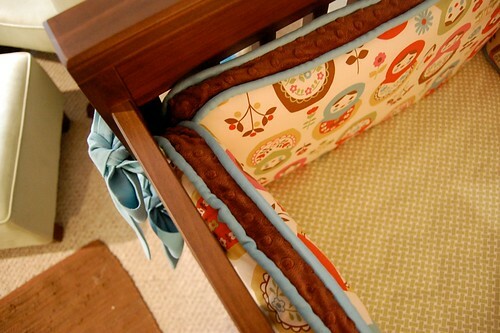 I love the piping and the brown minky dot on the tops of the bumpers! I specially requested this, and Brooke delivered!! After searching FAR and WIDE I finally found these green boxes that fit perfectly in the cubby holes! 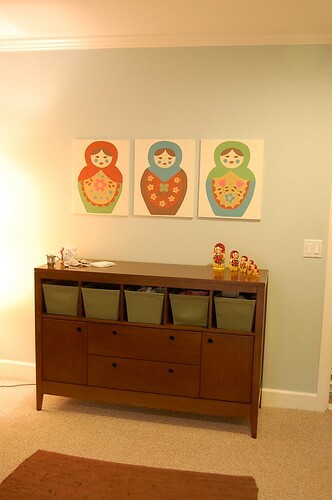 There are brown ones that are supposed to go with this piece of furniture and of course they were discontinued and I could not find them anywhere. I even called the company who designed the furniture and they couldn't tell me where to get them. Finally, while perusing in Bed, Bath, and Beyond I came across these little green blessings! While I realize that green boxes seem like unlikely blessings, believe me when I say I had looked EVERYWHERE for some that fit and matched, and it was such a relief to finally check this off the list! 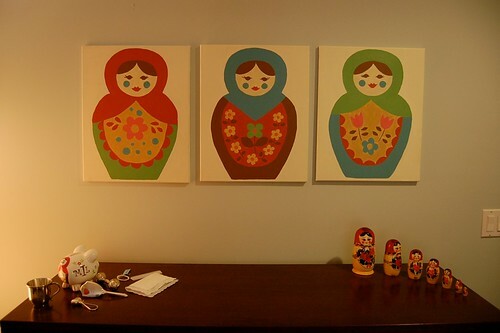 My wonderful and talented sister and I painted these canvases to match the bedding! Thank you, Meg, for all you've selflessly done to help me with this room. I couldn't and wouldn't have done it without you! I love you! I bought some wooden frames from the craft store that I'm going to paint to put on this table. I'll have to fill them with some sweet pictures! 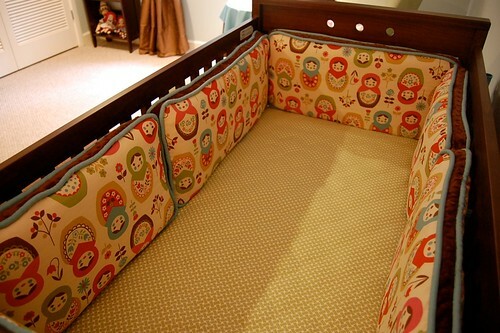 I am so glad we decided to get the changing table that goes with our set. It has provided a lot more storage and fits perfectly in the room. Here are Mommy and Daddy! We're both about a year old in these pictures. 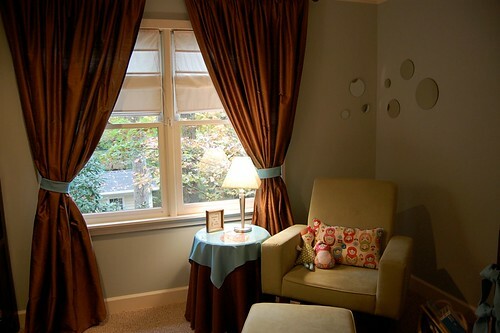 Here's where my inspiration for the room began. These are just a few of my many dolls. 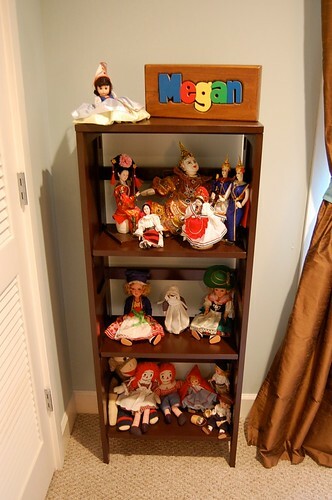 The top bunch include ones from the countries I have visited, the second bunch were my mom's from Germany, and the bottom bunch are some Madame Alexander dolls, Raggedy Ann and Andy dolls, and Trey's sock monkey. The "Megan" blocks are my sister's! 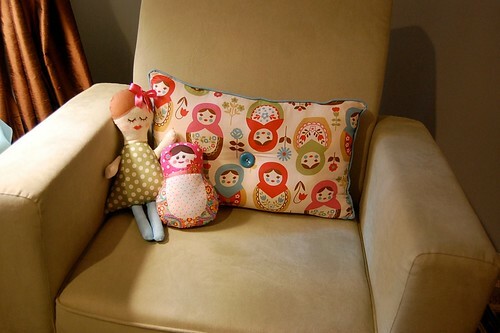 I made this comfy lumbar pillow and my friend, Mary Catherine, made the stuffed dolls! 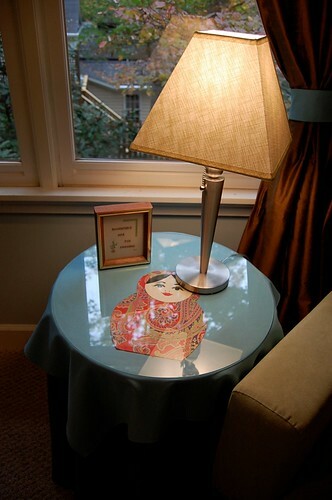 Here's my little table--the doll under the glass came from a gift bag that Jess gave me! My grandfather, lovingly known as "Do-Daddy" cross stitched this. He was my mom's dad and he tragically passed away about a month before I was born. I hate that I never got to know him, but I am so thankful to have this little memento as a reminder of his legacy. My mom says that he just loved his girls (he had 3 including my mom, plus a son), and would have been tickled pink to have gotten to be a grandfather to 7 and great grandfather to 2 little GIRLS! 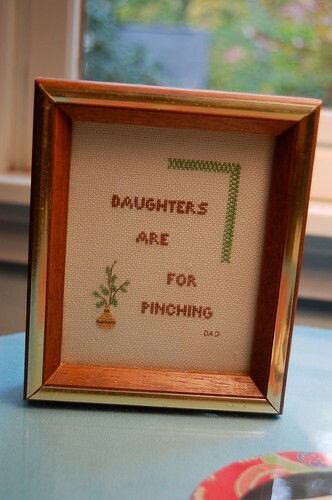 When my mom was growing up Saturdays were "pinching days"...thus, the quote. I guess he would just chase his daughters around all day and pinch them! Not quite sure I understand it, but it's sweet! Well, there you have it! The closet is organized and stocked with everything we need (thanks to all our wonderful friends and family! 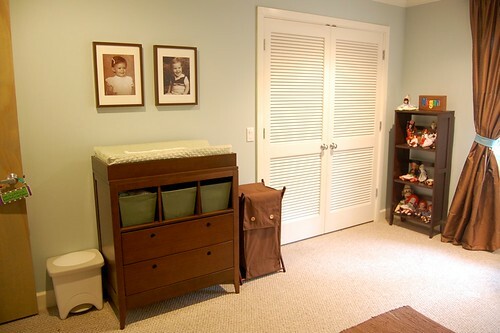 ), and all things baby have been washed and put in its designated green box or drawer! Now we just need Megan Lael to make it all complete! 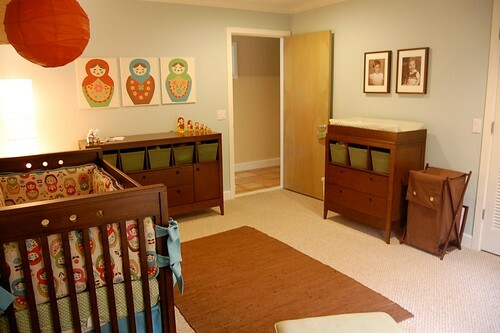 That is such an awesome and adorable nursery!!! So perfect, and ready for her! Congrats on finishing it, and making it look like you envisioned! I love the completed look, Kell! Looks awesome!! 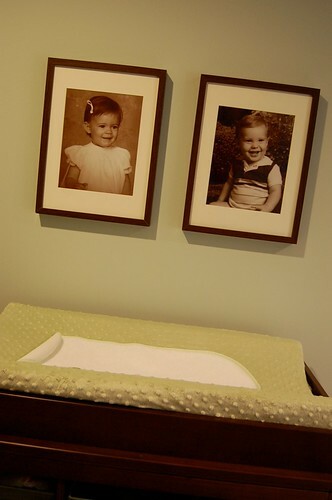 It I had not sat in this nursery myself, I would have though these pictures were out of a celebrity baby nursery design magazine article! It looks phenomenal Kell!! 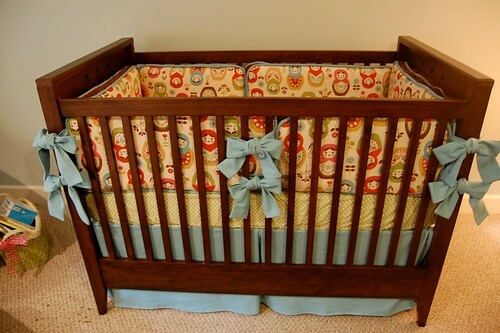 Can't wait to see the Cutie IN IT! Less than TWO WEEKS!!!! I thought I had posted a comment but apparently it did not go through. 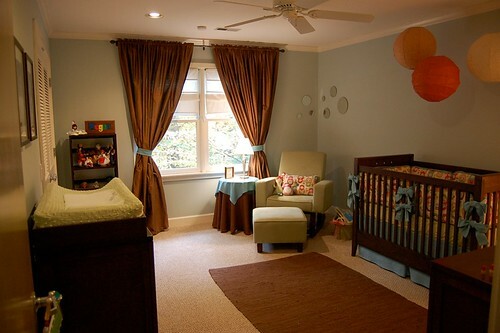 The nursery looks amazing. 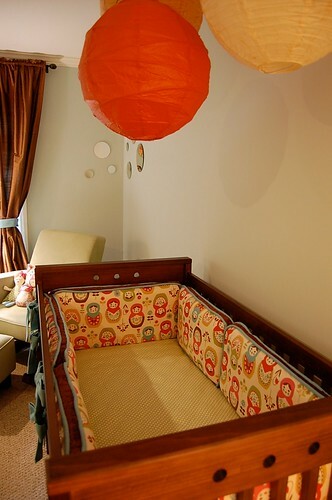 I agree with Jess that it truly looks like a celebrity nursery. You did a great job. Brooke did an amazing job on the bedding! Love it!